Knee Length - slightly longer at the back than the front (part of the design) so this falls just below the knee. Short sleeves - rolled sleeves. 🔘From a non smoking house. BLUE PINK ORANGE AND YELLOW FLORAL PRINT ON STRIPED WHITE BACKGROUND. OPEN DETAIL ON BACK WHICH TIES WITH A BIG BOW. CUTE SKATER STYLE DRESS. Topshop Khaki Green Bodycon Jersey Dress, size 12 Brand new with tags Dispatched with Royal Mail 2nd Class. Topshop Black Polka Dot Midi Dress Size 10. With a zip at the back for a good fit. The perfect summer piece for your wardrobe. This comfortable, breathable dress is great to wear out and about with white trainers or dress up in the evening with high heels and a red lip. The style is so flattering for all body shapes. Short sleeve and long neck means that it can be worn at work too. Slight bleach marks but not noticeable as it’s on the skirt by the pleats. TOPSHOP Tan Knitted Crochet Dress in UK Size 10 . Has never been worn . Tan coloured, in cotton knit . Measures 33" from top to bottom down the back . TOPSHOP Black Jumper Dress Size 14 EUR 42. Condition is Used. Dispatched with Royal Mail 2nd Class. Topshop Moto Blue Western Denim Dress UK 12 Only worn a couple of times - great condition Feel free to message me if you have any questions :) Sorry, no returns. TOPSHOP Super Chic Black & White Jumper Dress Long Sleeve Shift Petite Size 10. Condition is Used. Dispatched with Royal Mail Signed For® 2nd Class. TOPSHOP Emerald Green Pinafore Style Cutaway Dress. Size 12. Worn Only Twice. Gorgeous TOPSHOP Emerald Green Pinafore Style Cutaway Dress with button detail. Size 12. Condition is Used but dress has been well looked after and only worn twice. Comes from a smoke & pet free home. Dispatched with Royal Mail 2nd Class. Only PayPal accepted. 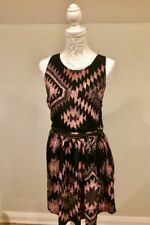 Topshop Black Backless Mini Dress With Tassles - Size 8. Dispatched with Royal Mail 1st Class. Lovely dress, more mustard tone than yellow in real. Used only once on holiday. In excellent condition and in my honest opinion the pictures do not do justice to the dress. It’s very beautiful in real. Woman's TOPSHOP Grey & White Stripes Dress with Front Ties. Size 14. Used. Stylish & comfortable. Soft pull on dress. Fit and Flare Skater Style Sun Dress. Flower Crochet Waistband. Button Back Detail. Jersey & Netting fabric For flattering Fit. Burgundy in Colour. Photos do not do this stunning dress justice.They do not show the beautiful cut and shape of this dress. LadiesSkater Dress. A stunning dress at a bargain Price. 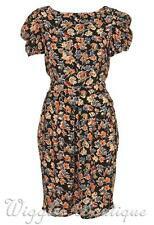 Topshop Demin Shift Dress Size 8. Condition is Used. Dispatched with Royal Mail Signed For® 2nd Class. UK size 10. Only worn once and still in excellent condition. See photos. UK sales only. BNOWT TOPSHOP SAND POLKA DOT TIE BACK MIDI DRESS SIZE 8. Condition is new without tags. ‘Topshop’ label has been cut out. Dispatched by Royal Mail second class. Size 10, Quirky appliqué patches on the dress and a lovely cut out section on the back add unique detail. Scarf, plimsolls, book not included. A lovely, simple boxy shift in quite a thick denim. Side seam panels, feature panelled hemline giving it that little bit of extra style. Great casual look - can't go wrong. Knee Length. Ladies Blue Dress. Fully lined with a thin stretchy lining ( apart from the sleeves ).